There is not very much long distance passenger traffic on the Latvian railroads. 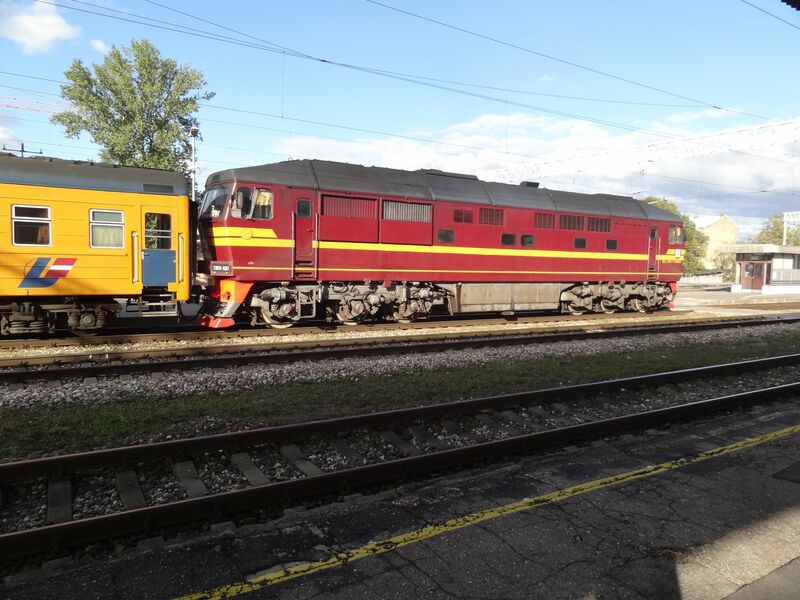 Most of the long distance traffic is run by these old type DR1 and DR1A diesel multiple units. 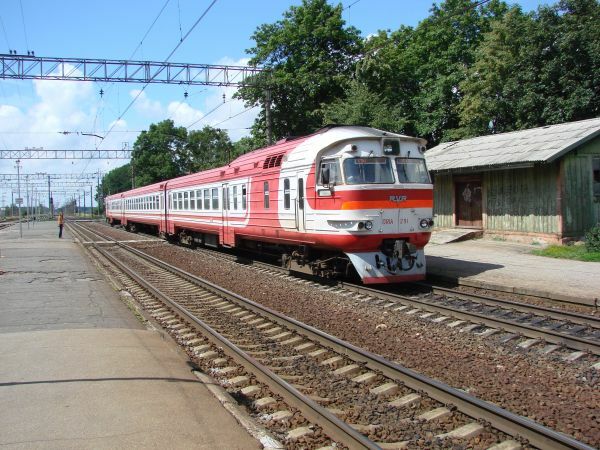 This is a 1960s design built at RVR in Riga. This one is a DR1A unit running a service from Riga to Zilupe for the LDZ subsidiary company Latvijas Ekspresis. Zilupe is the border crossing station towards Russia in the very east of Latvia. Zilupe was earlier known as Rosenau or Rosenovo. Picture at Salaspils station 1.4.2017 by Ilkka Siissalo. Another picture of the same DR1A unit. Picture at Salaspils station 1.4.2017 by Ilkka Siissalo. The other end of the same DR1A unit. Picture at Salaspils station 1.4.2017 by Ilkka Siissalo. There it goes. 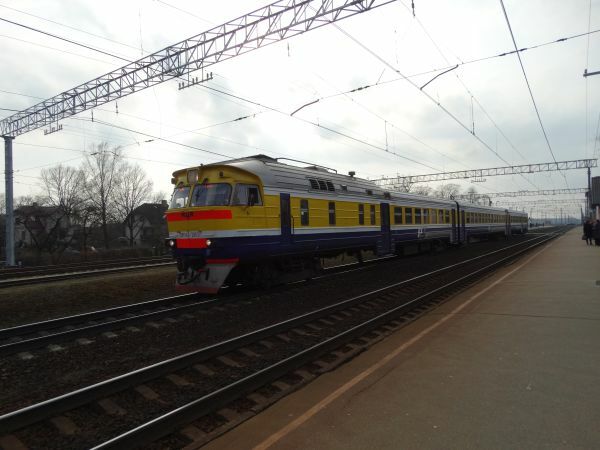 A DR1A unit leaving Salaspils towards Zilupe. Picture at Salaspils station 1.4.2017 by Ilkka Siissalo. 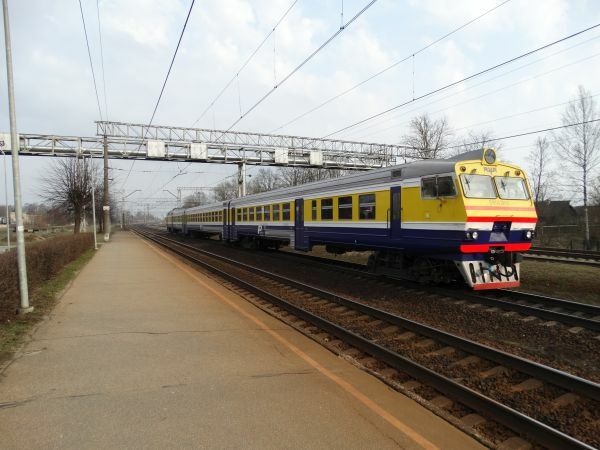 A similar DR1A unit leaving Salaspils towards Krustpils. Picture from Salaspils station 27.6.2018 by Ilkka Siissalo. 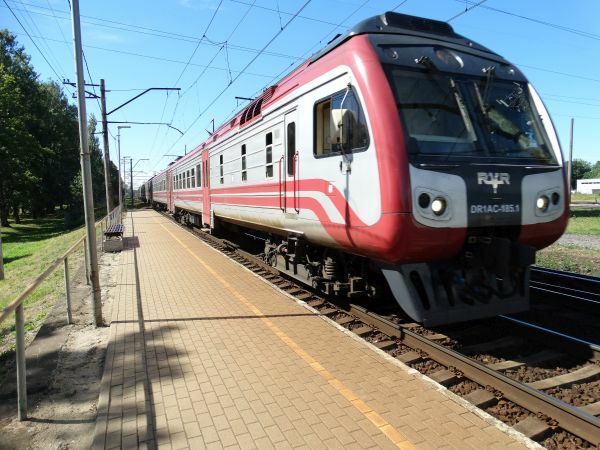 A long distance service Riga - Krustpils is stopping at the Skriveri station. Picture 25.5.2015 by Ilkka Siissalo. A normal DR1 or DR1A unit has one "bulky" end with a diesel engine and a more sharply formed driver's cab wagon at the other end. This one is different: It is a combination of two DR1A units with two engine ends. Picture of a Riga to Daugavpils service 28.9.2013 at Riga main station. Picture by Ilkka Siissalo. A Latvian DR1A like they used to be before any modernisations or repaintings. Picture at Salaspils station 4.7.2007 by Ilkka Siissalo. 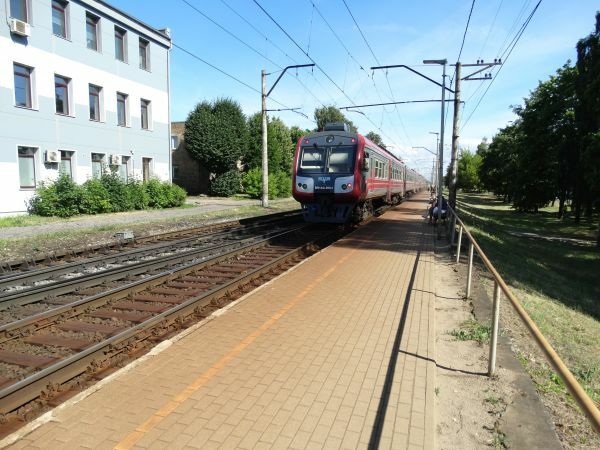 Same train as in the picture above, but seen from the other side. Picture at Salaspils station 4.7.2007 by Ilkka Siissalo. 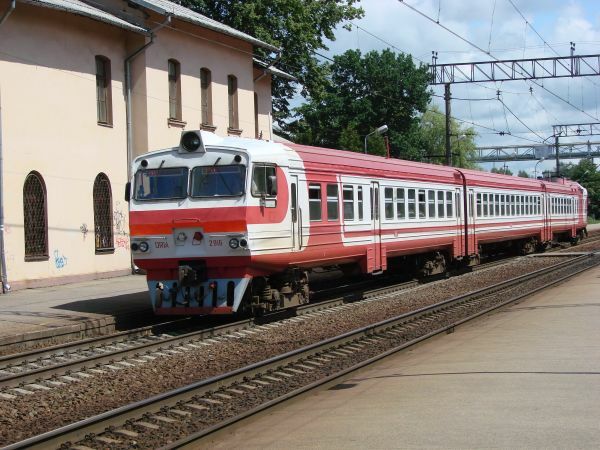 This is basically the same DR1A train as shown in pictures above, but this is one of those units that have been modernised by DMU vilcieni in cooperation with the original manufacturer RVR, Daugavpils Lokomotīvju Remonta Rūpnīca and Zasulauks depôt. 19 DMU train wagons were modernised in 2016. Picture from Škirotava station 27.6.2018 by Ilkka Siissalo. The train is rushing past with a very high speed, therefore the picture is not totally sharp. Picture from Škirotava station 27.6.2018 by Ilkka Siissalo. 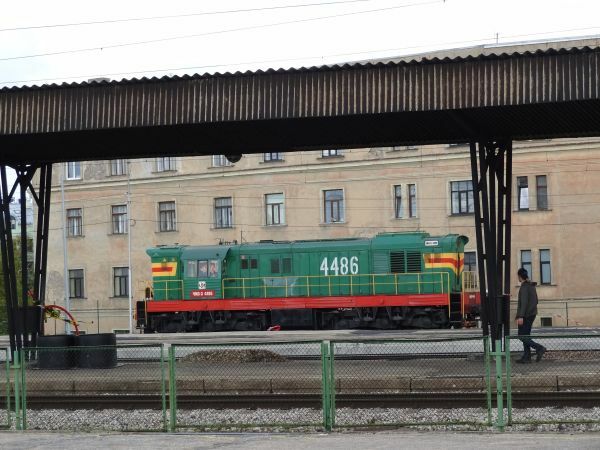 Latvian state railways LDZ has one old Russian class ChME3 engine permanently at the main railway station of Riga. Its main purpose is to be a switcher engine for long distance passenger train coaches. There are daily international trains to Moscow, St Petersburg and Minsk using traditional coaches and large diesel engines. 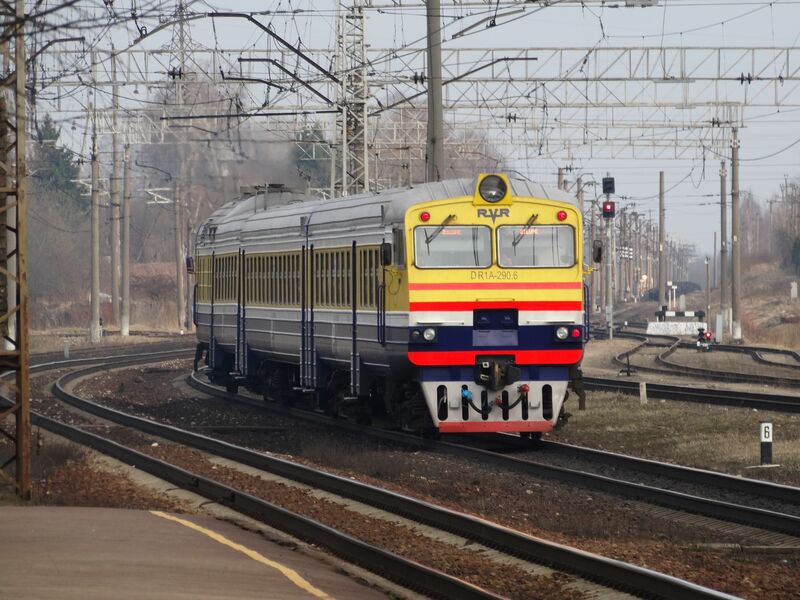 Photo at Riga main station 7.10.2012 by Ilkka Siissalo. 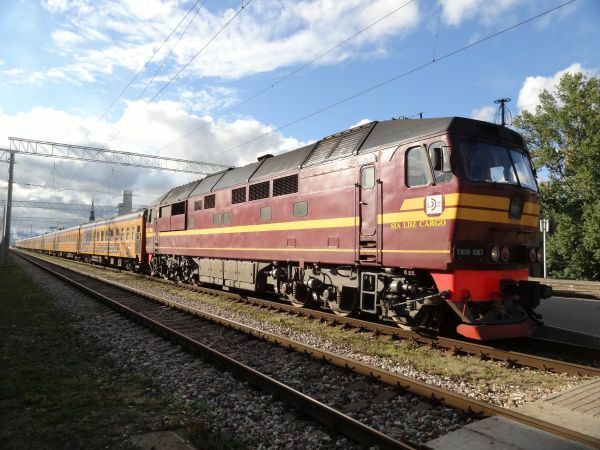 "Latvijas Ekspresis" international express train Riga - Moscow at the Riga main station. 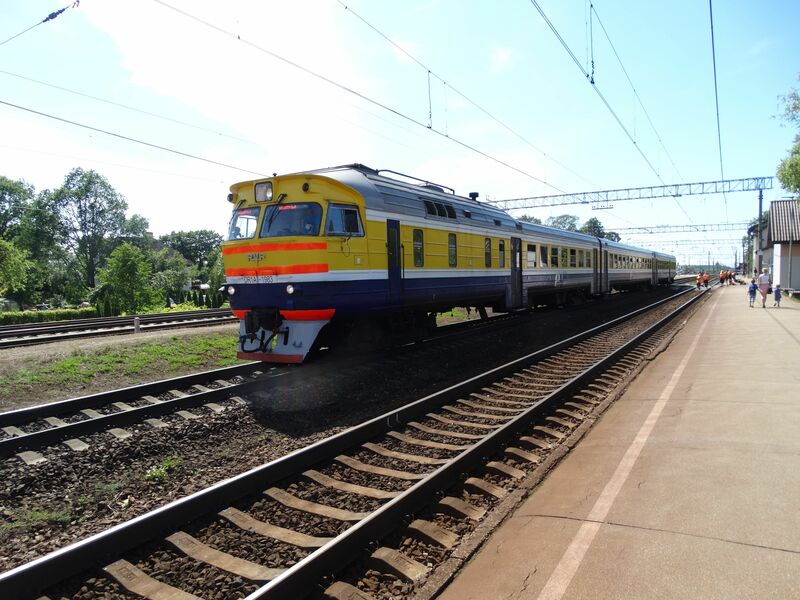 The locomotive is a TEP-70, which is a fast passenger train locomotive. Note however that the stickers at its sides tell that this one belongs to LDZ Cargo instead of the long distance passenger traffic division of LDZ. Picture at Riga main station 28.9.2013 by Ilkka Siissalo. 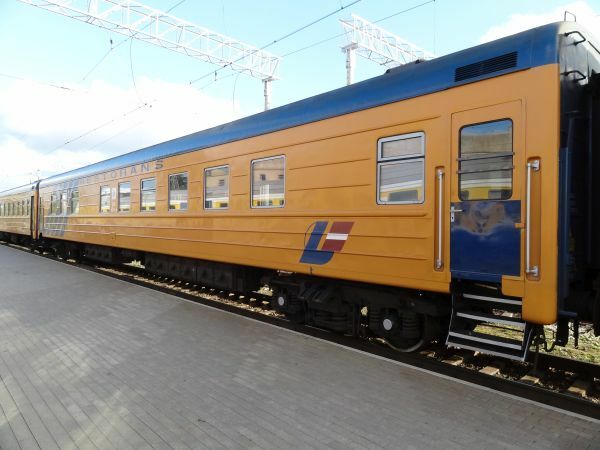 Restaurant coach of the "Latvijas Ekspresis" train. 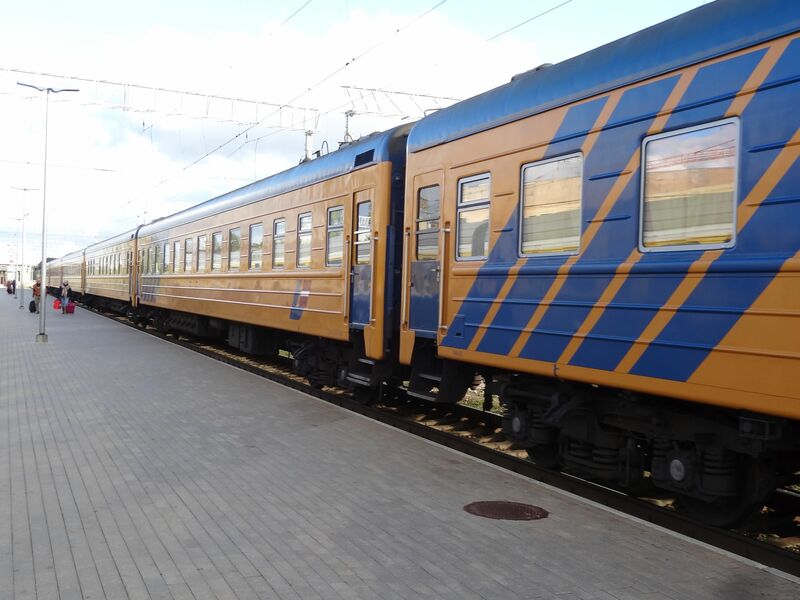 These are old Soviet Russian coaches, but modernised and repainted. But as often the case with Russian trains too, there was no central coach heating. Instead every single coach had its own small coal burning owens, spreading quite a smoke cloud on the station platform. 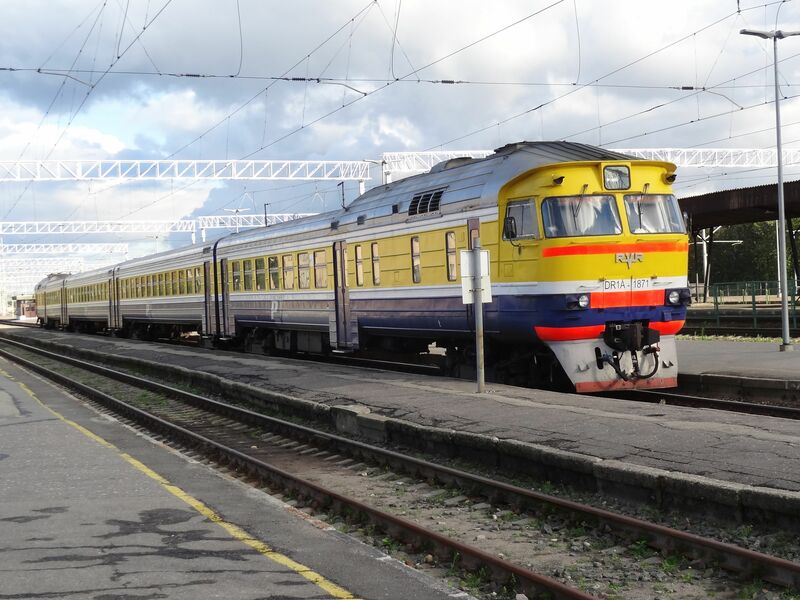 Picture at Riga main station 28.9.2013 by Ilkka Siissalo. Coaches of the Riga to Moscow international train "Latvijas Ekspresis". Picture at Riga main station 28.9.2013 by Ilkka Siissalo. 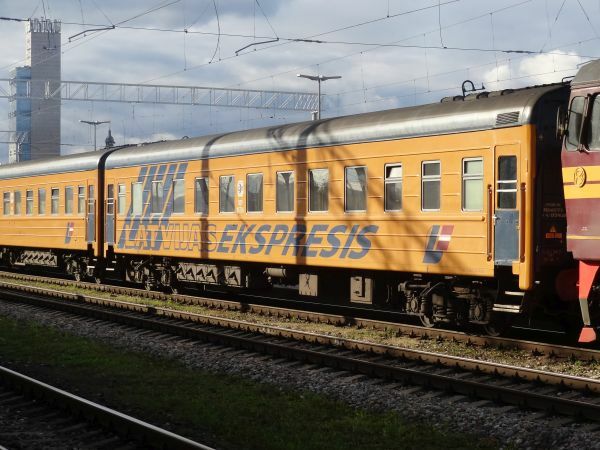 The first coach had the name of the train "Latvijas Ekspresis" in large block letters. Picture at Riga main station 28.9.2013 by Ilkka Siissalo. 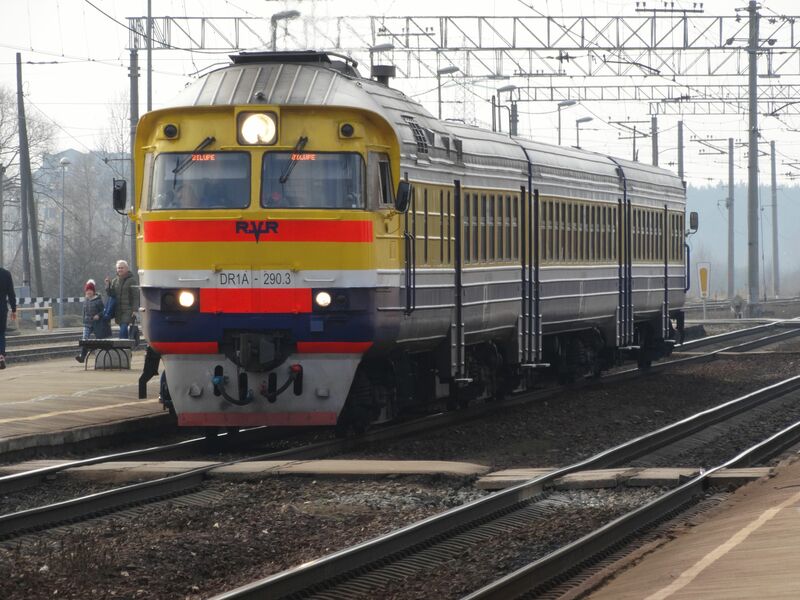 Another picture of the large class TEP-70 diesel engine. 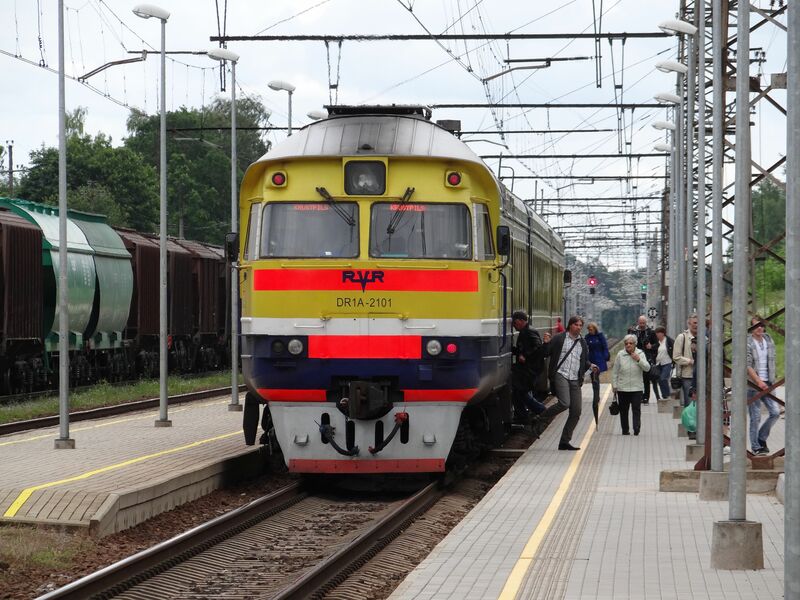 Picture at Riga main station 28.9.2013 by Ilkka Siissalo.